I’ve been “gone” for a while. From my blog, that is. But I’ve been busy working on a few other art projects. I completed the on-line Doodling class with Diane Culhane. Created lots of doodles and sketches to use in future artworks, some for this blog. Can’t wait to incorporate those! 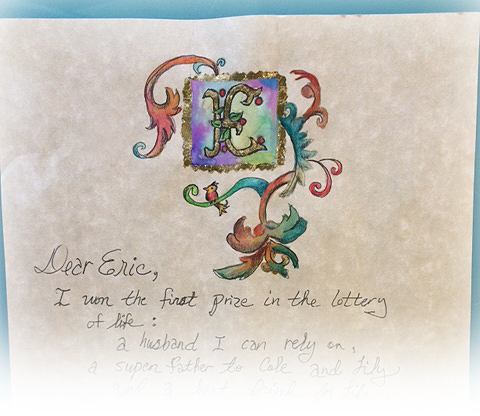 I had three workshops at the Richardson Public Library, where I created several other fun pieces: ink resist paintings, a personal color journal and an illuminated letter (I have my example of that below). Now, back to Pip! We left Pip at Herbert’s finance’s (Clara’s) family home in the shipyards. Herbert, his best friend and roommate, is there. He tells Pip about Clara’s gout-riddden, alcoholic, abusive father upstairs. Pip can hear him growling and screaming at Clara. Herbert also says, “To have Provis (Magwitch) for an upper lodger is quite a godsend to Mrs. Whimple.” Mrs. Whimple is the landlady. WHAT?! Maybe I got confused by Dickens’ language, but I thought just Herbert was hiding out here, not Magwitch too. Also, apparently Mrs. Whimple knows about Herbert and Clara’s engagement, but not her father. He does not approve of Herbert so they have kept this a secret from him. He thinks Herbert doesn’t make enough money. Herbert calls her father, real name of Bill Barley, Gruffandgrim. After receiving this information from Herbert, Pip meets Clara for the first time as she comes downstairs. He describes her as a captive fairy, a most charming girl. 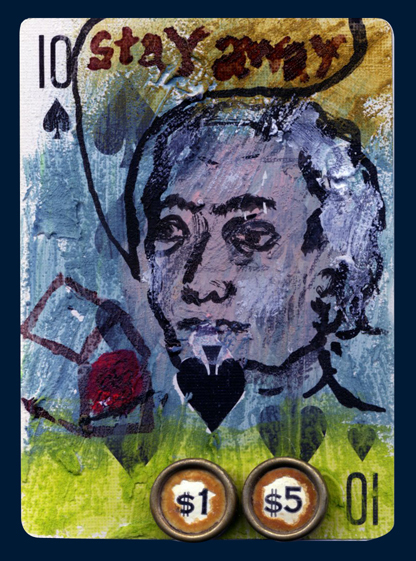 About my work above: I have started creating some very small artworks on old playing cards, an experiment for an upcoming workshop. These are artist trading cards, which are very popular for artists to make and trade but are never sold. Some people have huge binders of the ones they’ve collected. Maybe I will start making and trading them too. I can see how this is addictive, as they can be created very quickly, being on such a small scale. I glued on some vintage cash register keys that my daughter gave me. Love those! Below is the illuminated Father’s Day card I created this week for my husband. I hope he likes it!